Recently I embarked on a search for a second monitor. As an Apple junkie, I really wanted to get an Apple Cinema display to go with the rest of the Mac computers in the house. but as a realistic person on a budget, I went on a non-Apple hunt instead. Tying to fit the features and size I wanted into a budget that didn’t make me cringe took longer than I thought. What did I want the monitor to do? How did I want to use it? I use the PlayStation 3 for gaming and am not a World of Warcraft/Diablo girl, so I wasn’t too worried about a monitor calibrated for game play. On the other hand, I knew because of my job I’d need to watch a lot of movies, music videos, concert footage and presentations. I also knew I needed it to have built in speakers and a headphone jack – I don’t have room for external speakers in my office, and my office mates appreciate me keeping some of the no-so-awesome movies I watch while considering representing them to myself. In the end, Google searches were too broad so I started turning to tech sites like NewEgg for better help. For what it’s worth for someone who doesn’t want to geek out over hours of tech specs and who just wants to solve the problem of needing a second monitor – starting with the tech specific sites would have saved me time. In the end after narrowing by price, resolution (I debated 1080p but in the end I’m happy I chose it), connections, and more, I ended up with a monitor in my budget that plays well with my MacBook Pro 15.4″ and MacBook 13″, as well as a DVR box from Comcast, an Apple TV and other toys if I choose. So what did I get? 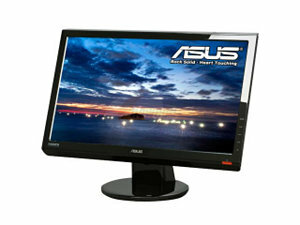 An ASUS 21.5″ Widescreen with HDMI, DVI, VGA, and Composite connections, speakers and audio jack; Full 16:9 HD 1080p LCD. At first I was concerned it was not going to be compatible with the Apple family, but like everything I throw at the Macs it was plug and play. All I have to do when it’s hooked up to the mini-DVI port via adapter is drag program windows to whichever screen I want to view them. If I want to preview a presentation, I just have to turn on mirroring temporarily and I get the timer and notes on the laptop and the presentation in display mode so I can practice. One thing I already love about the monitor: you can fine tune the display settings using the side panel buttons to show different resolutions and more for each device you plug into it, or even on a game by game basis if you are a gamer. And at the under $200 price tag, my wallet didn’t cry when I made the purchase.